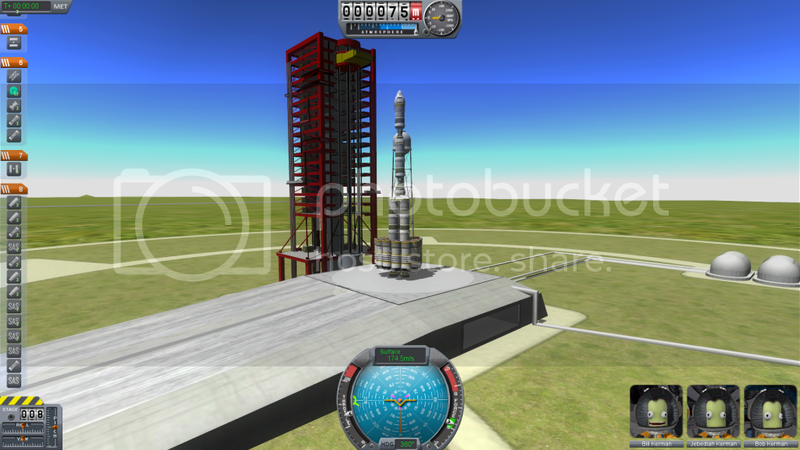 I'm just going to post the link to the mod-deposit of the Kerbal Space Program forum here. Jahoclave wrote: So, is a double double check 2^2 or, because it's two double checks and checking the double (2x2)^2? Actually, Soralin meant double Czechs. But can two Czechs take a Canadian and a Swede? That depends, have the Czechs been double Czeched? Jahoclave wrote: My real question, how well is physics coded in this game and, well, once I exceed the speed of light does the speedometer just say "warp speed?" I got up to about .4c (around 120,000 m/s) and didn't notice any time dilation or blue shift. 120km/s is .4% of c not .4c so you wouldn't be seeing any relativistic effects anyway. I would double check that. 120 000m/s should be enough to notice relativistic effects without needing to carry an atomic clock or spectrometer or suchlike. I suspect this means that FTL travel is possible, if you can get enough thrust. At 120,000 m/s (I'll call it 0.0004c), the lorentz factor is 1.00000008000 and some other stuff which is close enough to 1 that without some pretty accurate equipment everything will look nice and Newtonian. eSOANEM wrote: I'm having a lot of problems with rockets getting unstable as they leave the atmosphere when they start spinning uncontrollably (even with large numbers of SAS) before eventually snapping. Has anyone else had a similar problem and if so, how did you guys solve it? Post a screenshot of your rocket. I've never had that problem (except one time when I was using some mod parts and made a ridiculously huge rocket), but it probably wouldn't be too hard to spot what's causing the spinning. I found this game on Facepunch. It never occurred to me to look for a thread about it here. Damn fine little toy (its not quite a game yet, but its getting there!) with a lot of potential. Looking forward to 0.9! Yay! Just wanted to let everyone know, version 0.9 is officially released now! You can get it here. The next sentence is the truth. - The previous sentence is a lie. Yakk wrote: The idea would be to mimic a space program instead of a space company. For the first while, because you are doing research, how "sloppy" you are doesn't matter. They just need a design. Between chapters, time would pass, and technology would advance. But you'd always be the one doing the "cutting edge research", and not the person doing "random contract work". So your first satellite mission is about proving you can get a satellite in orbit, not getting it "just right", etc. One could imagine getting new "launch pads" and the like. So you'd start with an earth-based one. After installing satellites and landing on the moon (coming back optional), you'd have to build a heavy-lift rocket, which means they'd use your design to build a space station -- allowing for space-based launches (with restricted parts, and higher costs). A moon base, a probe launched to various planets, a one-way trip to Kmars, a beanstock, deploying solar energy collectors, landing on an asteroid, building a comet-pusher to Kerraform Kmars, a solar sail craft that does a round-trip to Kupiter, etc. But I'm probably just crazy. I like thinking of stuff like this. I think an awesome concept would be that your space program was getting money from the government. You'd get money every month or whatever, and the amount would be based on: the success (and failure) of your recent missions, and random world events that are out of your control, like economic recessions. So if you get stuck on a mission, you'd start getting less and less money until they just shut you down and you lose. After completing a mission (perhaps you completed some optional 'quests'), your income would go up. A couple crashes in a short period of time and you're in trouble. With your money, you could buy parts/assemble your ship, or research new technology. Researching would take a long time to pay off (and maybe the time to research is random/unknown), but if you wait too long to research, then you might not be able to complete a difficult mission before the government shuts you down for inactivity. But yeah this is already a fun game. Not all games need a point. Adam H wrote: A couple crashes in a short period of time and you're in trouble. Alternatively, crashes could be an opportunity to create fireworks displays for the citizenry. Double posting because the latest update includes a moon! There is now somewhere for rockets to go. Also, there is a pretty map view with orbit lines that makes rocketry a hundred times easier. It took me a while to figure out how to do orbits properly, but since then I've managed to consistently land (read: crash) on the Mun. If you want your ship to stay intact, I suggest downloading some landing legs from one of these addons. I managed to get to the moon's sphere of influence when I tried it, and subsequently was slingshot around it. 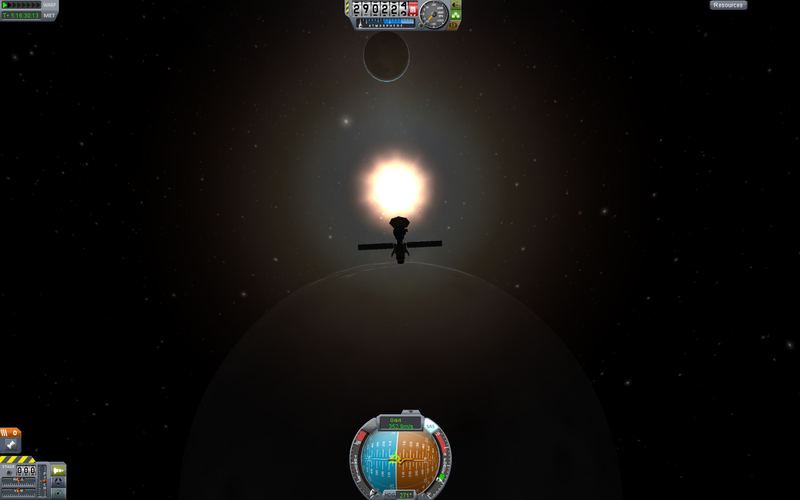 When I managed to burn all my remaining fuel to reenter lunar orbit, the game bugged out as I reached Kerbin's sphere. The result was that I was stuck at a point in space with no fuel. EDIT: I managed to get into a reasonably circular lunar orbit at about 1000m with the same design. Then I mashed the windows key when I went to cut off a circularizing burn. Oops. edit 2: electric boogaloo: I managed a powered legless landing. I had too much horizontal velocity, though, and it sheared off the entire lunar stage. So much for a return trip. So I tried the game (I think Feylias got me into it) and I hate it. ... First minecraft, now you. Give me back my free time. Anyway, I can't seem to figure out how the controls work. Are they relative to the instruments we see? Or is it somehow related to the (radially-symmetrical) spacecraft? So far I've just had fun hilariously trying to get myself off the launch pad. I wish there was a way to see the events console live. The windows on the pod on the spacecraft are up, But I usually use the instruments to fly. I'm kinda confused. Is the pitch inverted? Also, I always seem to lose stability instantly upon detaching boosters. This isn't a space program. Mine is like an acrobatic fireworks program. Are you using SAS? Without it, it can be quite hard to keep a rocket going in a particular direction (of course, with it, it's quite hard to change that direction). Yeah, I realized I should be using that. I just lost the hotkey and had to search for it on the wiki. The game is awesome, but I wish they had a slow-down warp speed too. Sometimes I want to take a good look at my thing in flight. 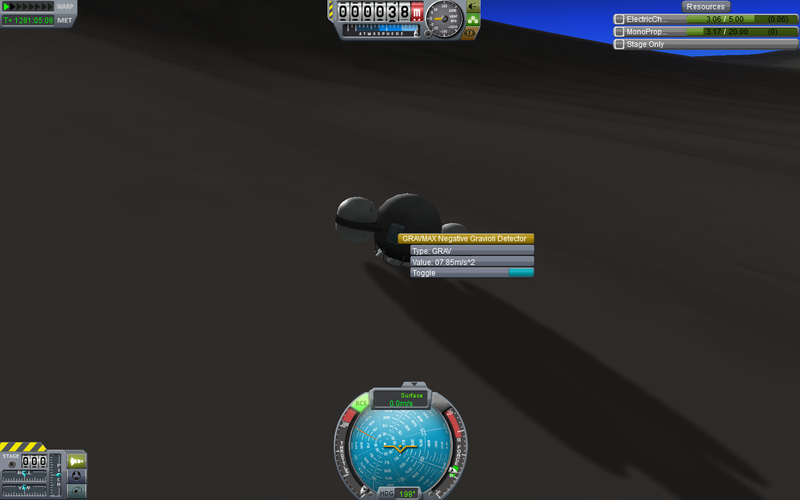 I managed to land on the lunar surface for a bit using a powered landing (Landing gears are for wimps), but I had to leave early because the whole 2-tank maneuvering stage and 1-tank return stage stack was tipping over. This time, I remembered the parachute. All stock parts, and no RCS or ASAS, because like landing gears, those are unkerbal. Resurrecting this thread because Kerbal Space Program is pretty damn awesome, and you can now pre-order the full version. Main site here, currently its 15 dollars, which gets you the latest version and all future versions. Some oftheawesome and hilarious things that can happen. Currently, I'm trying to successfully land on the Mun without blowing up. It's not going well. Bumping this because it's awesome, and the game has progressed a good deal, partly thanks to mods. There's now 5 planets and 8 moons, spaceplanes, persistent missions (ie, you can launch something to orbit, go design something else and launch it, and the first spacecraft is still in orbit), and a couple mods that give you actually useful payloads as well (I'm mapping Kerbin right now). You don't need to learn a whole lot, as you can grab mods that handle a lot of the routine things. I use MechJeb, which provides a lot of useful information and can automate routine tasks (anything from reducing eccentricity to launch-to-orbit). Of course, it's still a good excuse to learn things! The flaw is that I was trying to kill my horizontal speed while also stopping myself getting too much vertical speed, resulting in the lander flipping over a few times before meeting the ground, separating into its constituent parts. 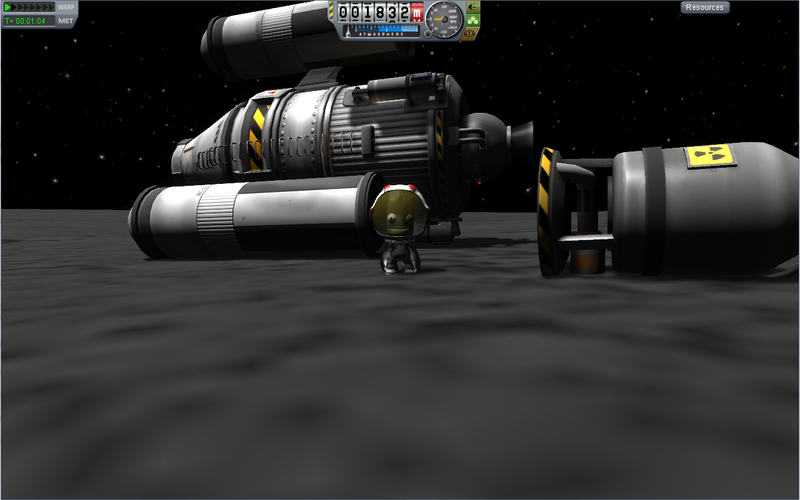 Oh, and the Mun-escape engine exploded. Luckily I was using a Mk1 Capsule so only one Kerbonaut is up there all alone. Watching fuel drain has never been so much fun! New resources allow for completely new possibilities. Energy, Fuel, Oxidizer and other resources now flow through your ship. Manage them as you fly, and pump them across parts. Does anyone know how to deploy solar panels? Right click on them and click 'deploy' or set up an action group, as far as I know. Success! I managed to ease a xenon-powered probe into a sub 300km orbit around the Mun, and it took the patience of a saint given how slow it was, and the fact that you can't fast forward when your engines are firing (they should really make an exception for ion drives). I still have more than three quarters my xenon fuel too, so I could quite easily break orbit and fly somewhere else. 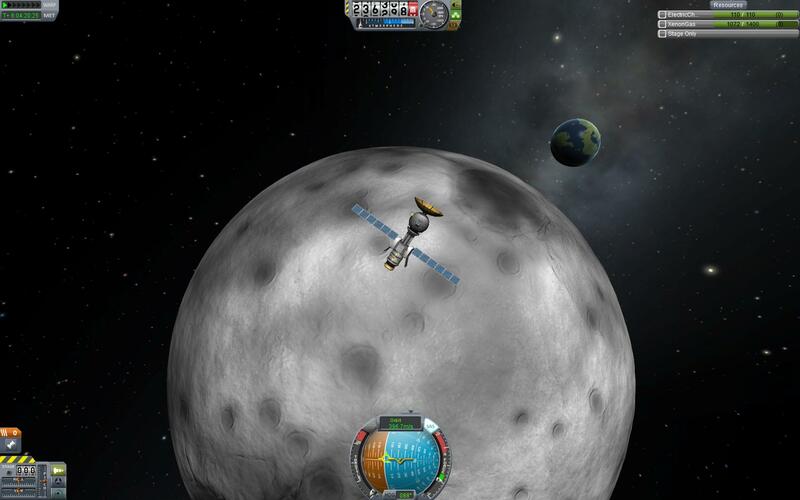 I know it's only a probe orbiting the moon, but it feels like a monumental achievement. Has anyone actually been able to land on the Mun or anything else yet? SlyReaper wrote: Has anyone actually been able to land on the Mun or anything else yet? Hell yeah. 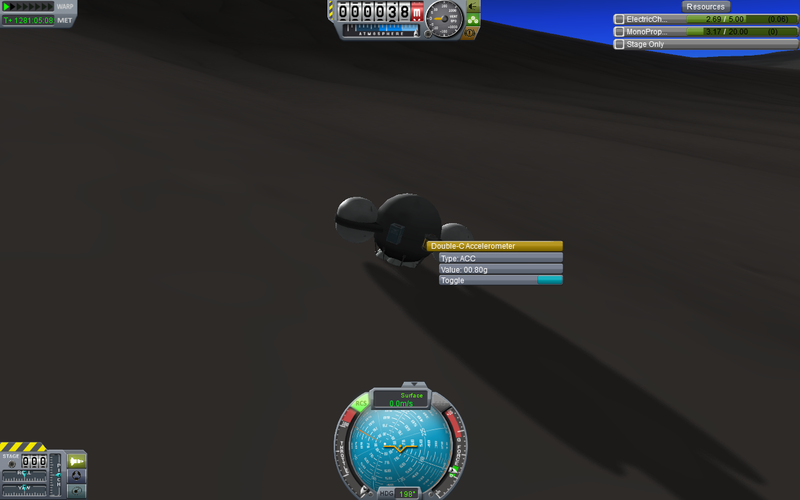 One small step for Kerbal, one giant leap for Kerbal kind. Unfortunately, the engines broke off and the lander tipped over, so they're stranded there. I don't think there was enough fuel for a return trip anyway. Can you mount a rescue mission? I played the free version to death, but it looks and sounds crazy awesome now. I think I'll buy it once I get sick of Dota 2. It might be possible, but it would take far greater skill than I have. But the Kerbals seem happy enough and those ships apparently come with infinite air, food, water, etc. They're just going to have to live there. Edit: just landed another one on the Mun, of a slightly different design. 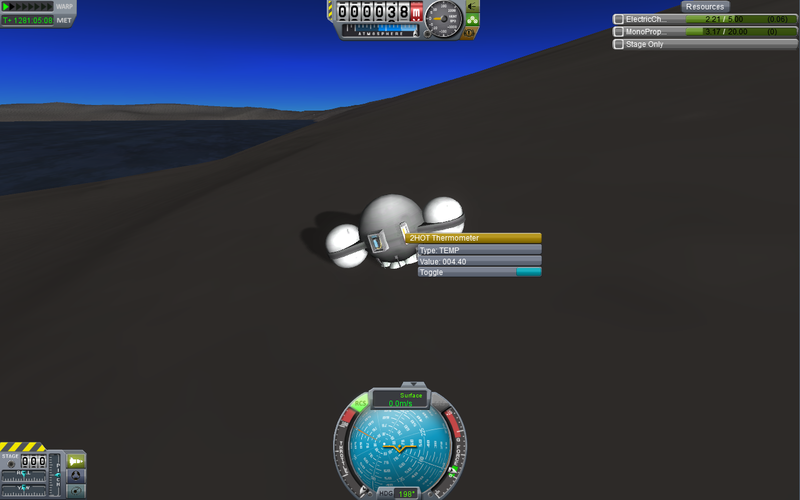 I managed to land properly on the landing struts, but bounced and turned over. Wasn't able to correct my orientation before hitting the surface again. Some bits exploded, but the command module remained intact. 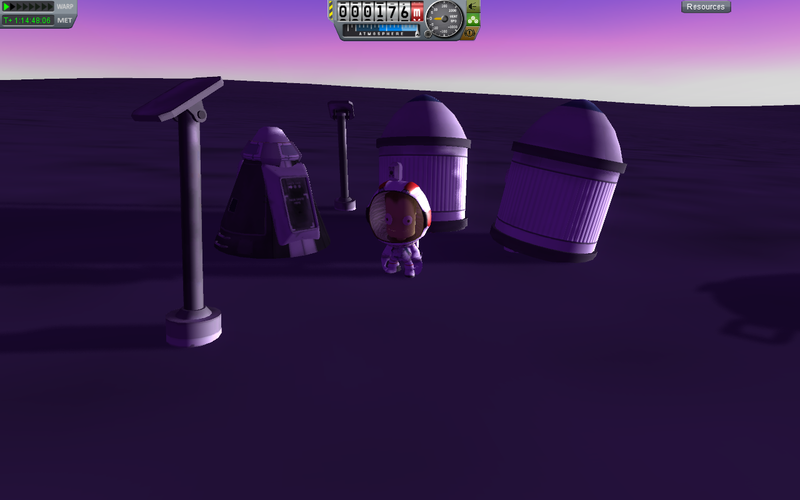 So yay, three more kerbalnauts stranded on an airless rock. Damn this game is addictive. I've been posting about my exploits on another forum, I'll paste them here too. I'm just about to get a probe into orbit around Duna. 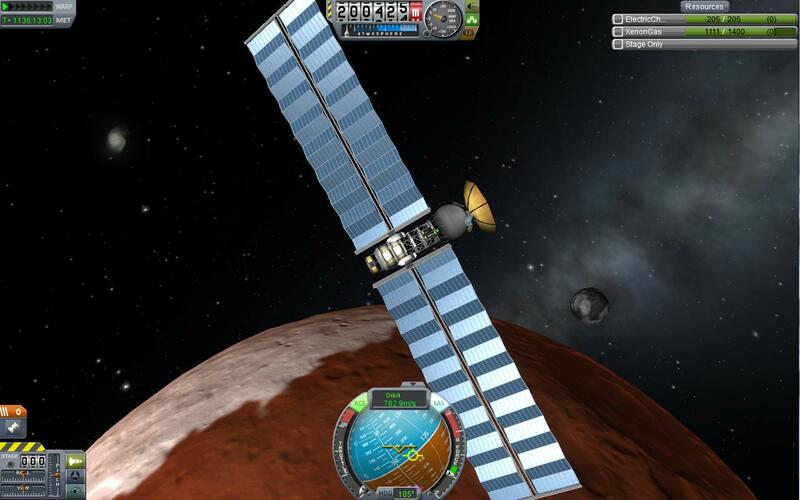 It'll be the first time I've managed to get anything in orbit around another planet. Exciting! And with oodles of xenon fuel left, so I could go orbit that moon Ike if I was feeling patient enough. Interplanetary travel is really hard. Even when I take the time to do the maths and work out what angle I need to burn at, the targets are so small, I can never get them in a Hohmann transfer orbit. I always end up circularizing my orbit and trying to rendez-vous with the planet like a space station. It takes ages and wastes a lot of fuel. Edit: just landed on Eve. 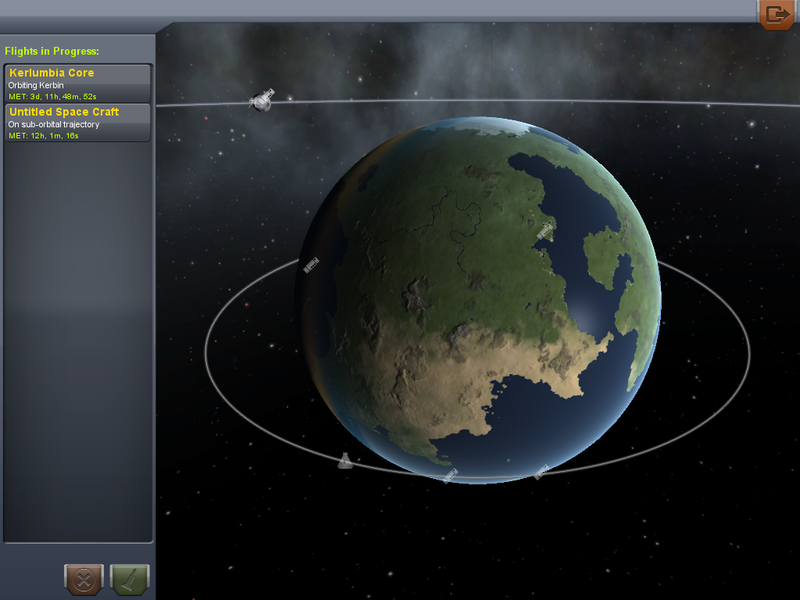 Get used to your new home, Bill Kerman, because there's no way for you to get back to Kerbin. It was annoying. I was doing a soft descent assisted by two parachutes, and then my ship just exploded for no reason. At least the capsule remained intact. Eve is an interesting planet. Thick atmosphere, it has oceans of purple liquid, and the gravity here seems to be quite strong. I quick-saved so I might try again to land my ship on the surface in one piece. Just for fun, I just strapped 6 linear RCS things to the bottom of a stayputnik, attached two radial mono tanks, and a radioisotope thermal generator to the top. This thing is ridiculous. No only has it managed to lift itself into space, it's currently on a a trajectory to rendez-vous with Jool, with 11.12 units of mono fuel left (out of 20). No staging, no conventional rockets, just me holding down the H key the whole time. Edit: that first one crashed and burned. I tried again, but this time with some science stuff attached. Managed to soft-land on Laythe, but my electric generator broke off. Had to be quick taking these screenshots before the probe died. All in all, that's a pretty cool moon. I had no idea there was a water world here until that first probe arrived in the Jool system. When that probe died, I just had to land a science probe on it to check its vital statistics. Awesome. I notice it's in a 1:2:4 resonance with Vall and Tylo - that must be how it stays at that nice toasty 4.4°C. Edit again: fast forwarding, I see that Laythe is tidally locked to Jool. No longer pasting: I have now figured out this manoeuvre node system, which makes interplanetary travel somewhat easier. It's nice to be able to experiment with your manoeuvres without wasting fuel in the process. You can even drag them around to work out the perfect time to burn. 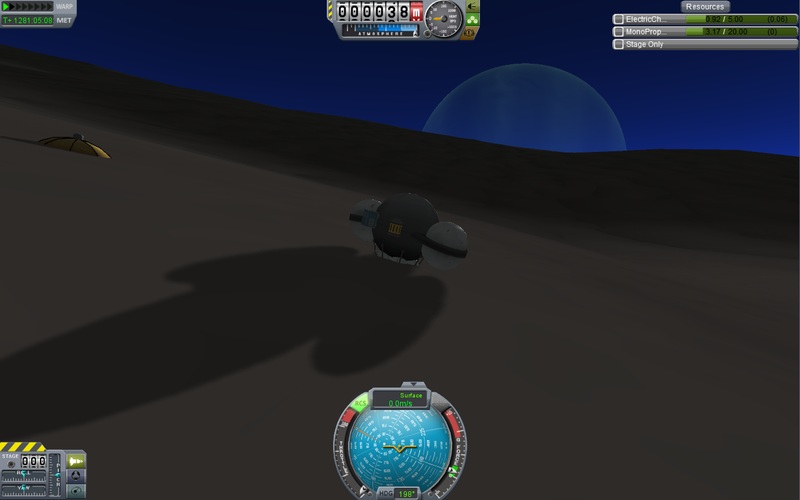 Oh, and I have just now managed to safely land three kerbalnauts on the Mun and return them safely to Kerbin. It was a direct ascent type thing in a massively over-engineered rocket, none of the complicated lunar orbit rendez-vous stuff NASA did for the Apollo landings. Like I said, this game is addictive as hell. There's a certain rush of adrenaline as you're coming in to land on the surface of another moon/planet, it's fantastic. The feeling of achievement when you successfully do something tricky is awesome. Damn, they added a lot since the last time I played.... gonna go for the mun! Yeah, the last time I played, it was the free version. A lot has been added since then, and it has been quite the learning curve. Oh, and everything I've been doing is with the vanilla version. I've not been using any mods. Can you have multiple things going at once? Like, a satellite in orbit, and then send a refueling mission to it? Izawwlgood wrote: Can you have multiple things going at once? Like, a satellite in orbit, and then send a refueling mission to it? The little cylinder shapes are debris, upper stages, that kind of thing. The capsule shape is Kerlumbia Core, part of a project that I'm working on and will post pictures of soon. 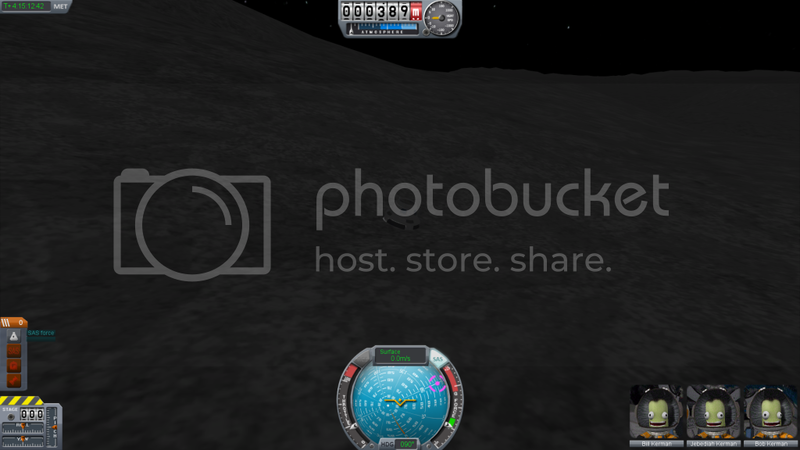 And you can just barely see the edge of a lander symbol on the left side of the Mun. It's actually possible now to dock your spacecraft to other spacecraft in orbit. That's a feature that was added in the latest version, 0.18. That's definitely a task that rewards patience, and I've not yet attempted it myself. I'd say it takes even more finesse than landing on another planet. SlyReaper wrote: It's actually possible now to dock your spacecraft to other spacecraft in orbit. That's a feature that was added in the latest version, 0.18. That's definitely a task that rewards patience, and I've not yet attempted it myself. I'd say it takes even more finesse than landing on another planet. Woah, so you could in theory do an apollo type mission? That would be pretty insane.